We conceived our daughter when we were newly married, no problems at all, actually were not even trying. When she turned about 20 months old, we started to try and conceive again. After months of trying with no luck, we sought our general OB-Gyn. They suggested getting some testing done on my husband, which came back with no real sign of issues. I went through several tests with, again, no signs of any issues. They suggested following up with a fertility clinic. 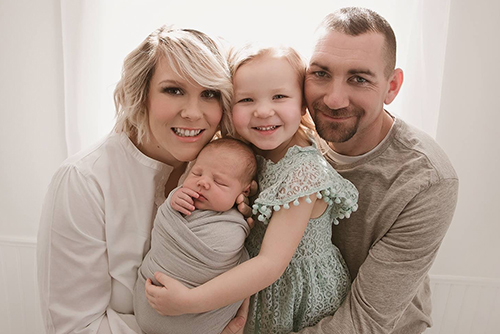 The first fertility clinic we sought, which was closer to where we lived, jumped immediately to IVF and told us we had only a 3% chance of IUI working due to sperm characteristics. My husband and I talked and decided that wasn’t the road we wanted to take and we have one healthy, beautiful child and that we should feel blessed. I was talking a couple months later to a friend who had used The Fertility Center and Dr Thakur and suggested just getting a consultation. We decided to just see what they had to say, and boy am I glad we did. Our first consultation with Dr Thakur was amazing. She sat down, reviewed our labs, tests, etc. She determined there was no reason not to try IUI first for a few rounds! We set up meds and treatment that day when we left the office to start our first round of IUI. The office staff and doctors were great during the whole process and very informative. Our first round of IUI was successful! We couldn’t believe it! Just when we were about to give up after trying for nearly 2 years, one simple procedure brought our family a huge blessing and the completion of our family. We are so blessed to have met these doctors and for the excellent care they provide. Thank you!